RESTASIS® is a prescription eye drop for increasing tear production which may reduce inflammation on the eye surface in Chronic Dry Eye. Research has shown that Chronic Dry Eye may be the result of a functional problem in the tear-producing glands of the eyes. This reduces tear production, resulting in an insufficient number of tears to lubricate or nourish the eye. RESTASIS® Ophthalmic Emulsion is a prescription eye drop which increases tear production. Tear production is often reduced by inflammation on the eye surface in patients with Chronic Dry Eye. The approved treatment is one drop in the morning and one drop at night in each eye, every day. Xiidra® is a new prescription eye drop for treating dry eye syndrome. The prescription for most people will be a drop in each eye twice a day. One main difference between Restasis, an older medication used to treat dry eye, and Xiidra is that Xiidra® is approved to treat dry eye symptoms. Xiidra stops a chemical chain reaction in the cells. Oncen the drop enters the eye, it binds with proteins in the cells. Those cells then stop the signals that, without the medication, would create many of the problems and symptoms of dry eye including itching, burning, pain, and redness. Many people notice symptom reduction very quickly once they begin using Xiidra®. What conditions does Restasis ophthalmic eye drops treat? 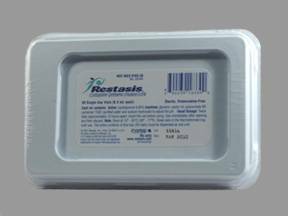 Restasis ophthalmic is used to treat Dry Eye, Drying and Inflammation of the Cornea and Conjunctiva of the Eyes. It is a medication that is used to treat dry eyes due to a certain type of eye condition (keratoconjunctivitis sicca). It works by increasing the amount of tears you make. Restasis helps to increase tear production but does not work well in patients using anti-inflammatory eye drops or tear duct plugs. How does Restasis help Dry Eyes? This medication is applied to the affected eye(s) usually twice a day, about 12 hours apart; or as directed by your doctor. One drop should be inserted intp each eye twice daily. Patients may use Restasis with artificial tears or over-the-counter eye lubricants, making sure to allow 15 minutes between inserting each type of drop. Restasis should not be used while wearing contact lenses. If contact lenses are worn, they should be removed before applying Restasis. Lenses may be inserted 15 minutes after applying Restasis. Restasis eye drops come in single-use vials (small bottles to be used for one dose). The liquid from one vial should be used immediately after opening for one or both eyes. The most common side effect of cyclosporine ophthalmic emulsion is a temporary burning sensation in the eye. Turn over the vial a few times until the liquid inside looks white and not see-through. Throw away the vial out of the reach of children even if it is not empty.